Funny… The last single I bought from Malaysia also happened to be cover versions of Bollywood songs. 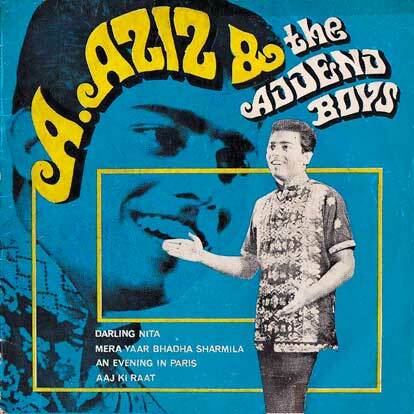 But where as that single was note for note recreations – and all from the same film – A. Aziz & The Addend Boys have transformed their versions into garage rock gems. This track was originally recorded by Mohammed Rafi for the film “Milan Ki Raat“. Unfortunately, there is zero information on the record sleeve or the record label. If you have any information on A. Aziz & The Addend Boys, please contact me or leave a comment. Catalog number EP 018 on Rose Record. No further information available. The film songs of Bollywood are the pop music of India. It is only in the last couple of decades that the film industry of India has come to the attention of the Western World, and even more recently – Hollywood. But those films – and the songs contain there in – have influence music around the world for many years. The films have been popular in Africa, Asia and the Middle East dating back to the 1950s. Besides being popular with Indians who have migrated around the world, millions of non-Indians enjoy Bollywood films for many years. I have seen an Israeli album of filmi songs in Hebrew. Then there is a live album by Usha Uthup that was recorded in Nairobi. I have a Malay pressing of S. Hazarasingh album and a South African pressing of Van Shipley album. As for M. Shariff, I have seen one other single by him performing songs from the film Bobby, on what is apparently his own label. If you have any further information about M. Shariff, or his Bombay Orchestra, please contact me or leave a comment. 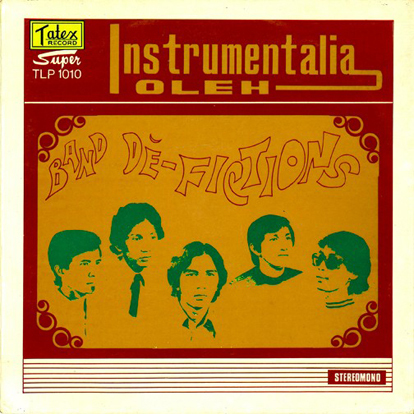 Instrumentalia was not just limited to Indonesia, but can also be found in neighboring Malaysia – although with notably different results. The best example of this – at least in my opinion – is Band De-Fictions. 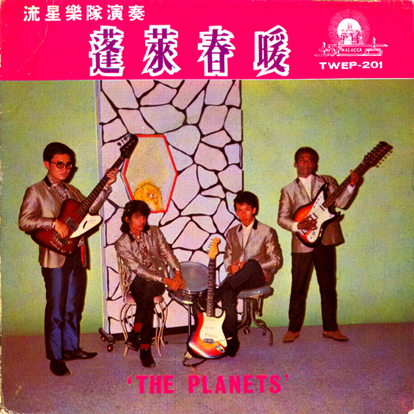 The band were from Muar, Malaysia – about halfway up the Malay Peninsula between Kula Lumpur and Singapore on the Straight of Malacca. They got their start as the backing the singer A. Halim as part of the Pop Yeh-yeh movement of the early 1960s. The band released a handful of singles, as well as a few albums before going out on their own. As far as I know, they only recorded two albums, both for the Tatex company – that also released The Brothers Hawk album Let’s Do The Funky. According to the Google translator, the members of the band were S. Dina on lead guitar, Zaideen on rhythm guitar, Idris Talib on organ, Wahid H. on drums, Kassim on percussion and A. Murad on “guitarist behavior”? Not quite sure what that is. Air guitar? But if I had to guess, I’m thinking that A. Murad must have played bass guitar. Catalog number TLP-1010 on Tatex Records of Singapore. No release date listed. When I finally decided to start hunting down the vinyl that would eventually become this website, this record was in the first batch, along with a S. Hazarasingh record and a very odd album of Thai Modernized Music… Actually, that’s a lie. My first batch of records were three Chang Siao Ying albums. I don’t count them, because I no longer have those. 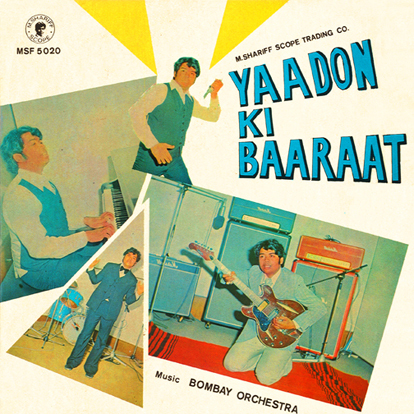 But this was definitely the first seven inch single of non-Western pop music. And as you can tell, I bought it solely for the cover. The seven inch single has to be the perfect format. It’s short and to the point. If you are musician and you are only going to be able to record two (maybe three or four) songs, you’re definitely going to pick you’re ‘A’ material. And the cover… I think some of the greatest artwork ever conceived has measured only seven by seven inches square. In this day of mp3s and i-tunes, the long playing album seems to be losing the battle. There appears to be a shift back to the single, now that the record companies have figured out a way to sell you just one song (with no manufacturing expenses). To be honest, I have never really been a huge fan of the LP. On most albums, there is always some filler. Maybe it’s because I have such a short attention span, I don’t know. And the advent of the CD player only made skipping those songs that were only “so-so” into a nervous twitch. Next. 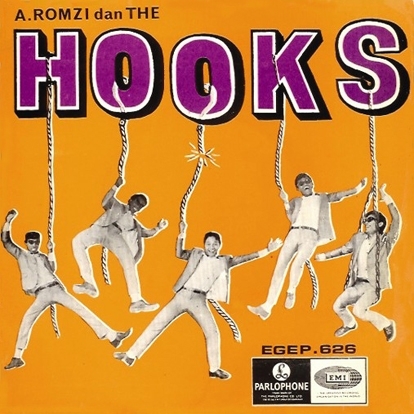 As for A. Romzi dan The Hooks, they were part of the “Pop Yeh-Yeh” movement of Malaysia and Singapore at the time. They recorded a handful of singles, this one being their first and most popular. A. Romzi later became a solo artist, and released records into the Seventies. Catalog number EGEP. 626 on Parlophone / EMI of Singapore, released 1967. 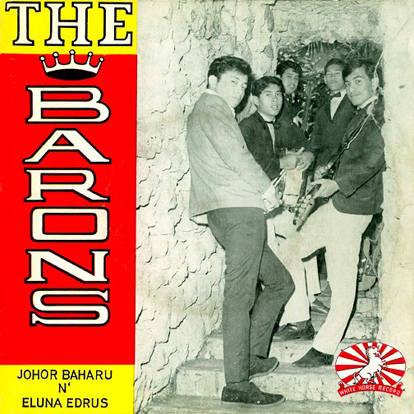 The Barons were from Johor Baharu, Malaysia. Johor Baharu, also spelled Johor Bahru, Johor Baru, or Johore Bahru and abbreviated as JB, is the capital city of Johor in southern Malaysia. It is within walking distance from Singapore, and is one of the largest cities in Malaysia. I haven’t been able to find any information about the band. As far as I know, this is their only single. I do know that the band members were: Eluna Edrus on vocals, Azmi Mohamed Khir on lead guitar, Adnan Mohamed on rhythm guitar, Mohamed Matta Abdullah on bass and Aziz Mohamed Khir on drums. Catalog number KSEP 5002 White Horse Record of Kuala Lumpur, Malaysia. No release date listed. The Planets were apparently from Malacca, which is southern region of the Malay Peninsula, on the Straits of Malacca, in Malaysia. I have not been able to find any information about the band. Catalog number TWEP – 201 on Tai Wah Record Co. No other information available. Since this posting, I have been contacted by Leo Playa. His uncle Anton Thomas, who most people called “Sonny”, was the lead guitarist of the band. Sonny passed away in July of 2009. Los Caballeros were from Malaysia. Malaysia is a federation of 13 states in Southeast Asia. The name “Malaysia” was adopted in 1963 when the Federation of Malaya (Malay: Persekutuan Tanah Melayu) Singapore, Sabah and Sarawak formed a 14-state federation. Singapore withdrew from Malaysia in 1965 to become an independent country. A small number of Eurasians, of mixed Portuguese and Malay descent, speak a Portuguese-based creole, called Papiá Kristang. There are also Eurasians of mixed Malay and Spanish descent, mostly in Sabah. Descended from immigrants from the Philippines, some speak Chavacano, the only Spanish-based creole language in Asia. This may explain the name of the band, and the fact that they use the word “señor”. 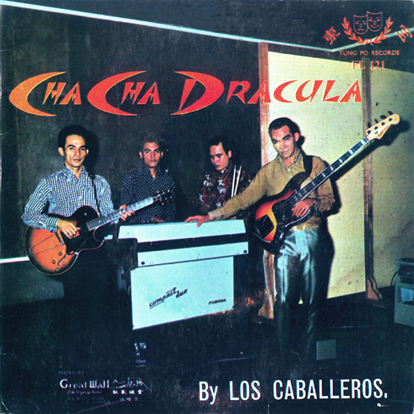 As far as I know, Los Caballeros only released one other single. And with the esception of this song, all of the other songs on this record are covers of Western songs performed in English. Catalog number FL 121 on Tung Po Records. No other information available. Dracula It’s a cover in broken Italian of Renato Rascel – Dracula cha-cha. Closing theme of the movie Tempi Duri Per I Vampiri (aka Uncle was a Vampire, 1959) starring Christopher Lee in person. I’m just wondering how this song landed in Malaysia… here’s the movie dubbed in English https://www.youtube.com/watch?v=RswjXaMMrNM or here the final in the original Italian version https://www.youtube.com/watch?v=g8BWIPfNGhQ on youtube you can find also a version by the famous Italian crooner Bruno Martino.